Line baking sheet with parchment or wax paper and set aside. In a small bowl whisk together mustard, oil, and spices. Season the 4 pork chops with pepper, then brush both sides of the chops with the mustard mixture. Press the grated parmesan cheese into both sides of the chops. Place the chops on the prepared baking sheet. Bake for about 15 to 20 minutes. The coating should be browned and slightly crispy and the pork should be cooked all the way through. Note: you can also use this recipe with boneless chicken breasts instead of pork chops & it is just as dee-lish! 3778 members have added this recipe to their cookbook. Mine didn't get as browned as those in the photo but it was still delicious! Everyone in my house scarfed it down. Added buttered green beans as a side for me and an additional side of brown rice with peas, corn, and carrots for everyone else. I made it exactly as directed and will be making it again. Thanks! DON'T USE WAX PAPER...it smokes up! Use Parchment Paper. Very yummy. This was very tasty and will be used again. Yum!! Although I only used 1/2 the ingredients for 4 people--we all loved it. Had it with Dijon roasted potatoes & green beans- very nice dinner. I used spicy mustard, it added a great kick. 27 Aug 11 by member: Jerry P.
AWESOME recipe! The entire family LOVED the pork chops! Definitely will be making these in the near future again! 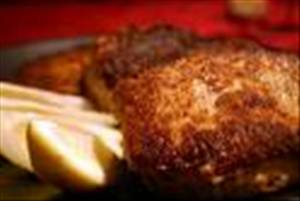 There are 417 calories in 1 serving of Parmesan Crusted Pork Chops. Calorie break-down: 40% fat, 2% carbs, 58% protein.